Etymology: Berberis would come from an Arab word which indicates fruits. Origin: China, Chile, Europe. In France, the thorn-Barberry was removed because it is an intermediate host for the fungus Puccinia graminis which caused stem, black or cereal rusts. like sunny positions, while Berberis julianae (photo below) supports zones in shade. It is a very tolerant shrub. 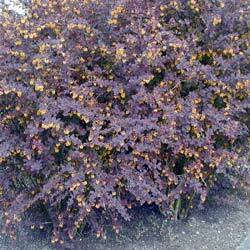 Hardiness: Barberry is hardy (zone 7: it supports cold until -17 °C or 1° F). Height: 60 cm (dwarf) to 3 m tall. Foliage deciduous or persistent according to the variety (450 species). The deciduous leaves are obovate and are adorned with beautiful colors in autumn. The evergreen leaves are oval, elliptical or oblong, more or less large or elongated. They measure 3-6 cm long. They are equipped with spines. The top is dark green, glossy for the persistent species. It turns red in fall. Yellow flowers yellow-orange or purple, grouped into clusters, fascicles, cymes or in umbels. The calyx includes 6 - 12 sepals, 6 petals provided with 2 glands at their base. They appear in spring. It rises of the middle of the flower a pistil, which becomes afterwards a fruit. Fruits: berries yellow-orange, or red more or less dark or black, according to the species of Barberry. They are individual or grouped in clusters. They measure 6 - 20 mm. They appear in the fall and remain in winter. Before maturity the berries are slightly toxic because they contain berberine. Ripe fruits are edible. They have a sour taste and are not appreciated by birds. Use: This small shrub is used in defensive hedges, because of its prickly leaves and its stingings. Find the ancient uses of Barberry described in the Encyclopédie ou Dictionnaire raisonné des sciences, des arts et des métiers (written between 1751 and 1772 under the direction of Diderot). Plant the Barberry in autumn. Seedling is made in March. It is also possible to multiply it by layering during the growing season or by cutting at the beginning of September. - Berberis thunbergii: native to Japan. Introduced into Europe in 1864. Its flowers are yellow. Leaves are deciduous. Variety ' Aurea ' has a yellow foliage very coloured in autumn. Variety ' atropurpurea ' carries a crimson foliage. - Berberis darwinii: It was named a darwinii in memory of the English naturalist Charles Darwin (1809-1882) who discovered it in the course of his trip on Beagle, when he made surveys on the coast of Patagonia (1835) and who introduced it into Europe around 1849. Shrub 2 m evergreen. Its fruits are blue decorative at fall. In the local pharmacopoeia, the bark is rich in tannins and roots that have antibacterial properties and tonic, among other things prescribed to treat dysentery. Usually we extracted a yellow dye used to dye wool and textiles. - Barberry in leaves of boxwood, Berberis buxifolia: shrub native to the South of Argentina and of Chile. It is considered to be a symbol of Patagonia, where it is called Calafate. Its small prickly leaves are dark green. Flowers are hermaphrodite, solitary, of yellow-orange color. The spherical fruits, of blue colour with purple. Berberis buxifolia 'girl ' is a compact and dwarf shrub of 60 cm high.